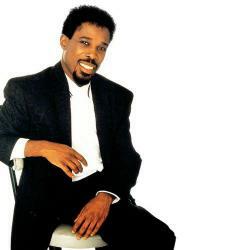 Billy Ocean (born Leslie Sebastian Charles; 21 January 1950) is a Trinidadian and Tobagonian British recording artist who had a string of R&B international pop hits in the 1970s and 1980s. He was the most popular British R&B singer-songwriter of the early to mid-1980s. After scoring his first four UK Top 20 successes, seven years passed before he accumulated a series of transatlantic successes, including three U.S. number ones. In 1985, Ocean won the Grammy Award for Best Male R&B Vocal Performance for his worldwide hit, "Caribbean Queen", and in 1987 was nominated for the Brit Award for Best British Male.